Sarnia Criminal Charge? Let Phillip Millar Help You! This confidential information will be forwarded for Phillip's immediate review. As a former Combat Officer, Phillip brings a refreshing approach to legal services. He served his country for over a decade and experienced battle firsthand. As a result, Phillip does not shy away from conflict when necessary and excels at defending his clients in high stakes scenarios. Phillip has appeared at all levels of court including the Ontario Court of Appeal. He firmly believes in providing his clients with wise counsel, not incentives to spend more on legal fees. Among Phillip’s many victories have been landmark court case decisions on behalf of sexual assault victims. He has also won important cases for the wrongfully accused as well as serious accident victims throughout London and Sarnia, Ontario. What makes Phillip a fighter is that he is not a paper tiger. His adversaries know this or will soon find out. In addition to his reputation as a top defender and advocate for Victims Rights, Phillip is a sought after commentator on news programs and has contributed his vast knowledge and experience to several articles and media outlets. I was found guilty of something I didn't do, but my lawyer suggested I simply accept it. A friend recommended I speak to Phillip Millar. Phillip was shocked by the trial and what had happened to me. He said it was hard to appeal and carefully explained all the risks. I felt like he was honest and not trying to take my money. In the end, we won our appeal. I feel so vindicated. My perspective on the justice system has changed. If indeed you are looking for justice, you need someone like Phillip. I was charged for something I did not do and the incident was used against me at work. I went to a prominent local lawyer. He told me I had to plead guilty and that I had no choice as I would lose. After paying him $3000 I realized I needed a second opinion. I found Phillip on the web, read his site and after meeting him decided to take my chances with a trial. I cannot explain how overjoyed I was to be found not guilty. Phillip ruled in the courtroom. He didn't just accept what they officer said happened. He researched it, challenged it and ripped apart his testimony on the stand. I cannot thank Phil enough for believing in me and saving my life. His dedication and skill are unparalleled. Phil and his staff are awesome. They have gone out of their way to make a difficult situation so much easier to handle. Will definitely use him again and recommend him to everyone. I have got to know Phil and his team well. They are professional and timely. Always reachable and excellent in what they do! Phil is very charismatic and dedicated. I felt like I was in good hands at Millar Law. I was kept up to date on progress and the staff is very knowledgeable. Thanks Phil and staff! BEST firm on the planet. 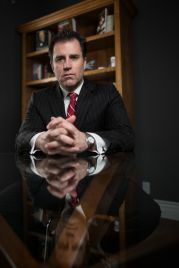 Mr. Millar is one of the few lawyers that actually wants to FIGHT for his clients.